The Devil's Purse Brewery, located at 120 Great Western Road in South Dennis, is the latest craft brewery to open on the Cape. Already, the Cape and Islands play host to various wineries, breweries, and distilleries, and the area is also known for their many local offerings, so Devil's Purse will be a fine addition to all the wonderful things that are locally produced here. The Brewery opened in spring 2015 and is dedicated to making "exceptional handcrafted beers". The Brewery offers several beers for sale at local restaurants, as well as beers for growler fill-ups at the brewery. The growler fill-up times are Tuesday through Saturday from 12 to 6pm, according to the website. So be sure to check out the latest craft brewery in the area, or at least try some of the suds at one of the many local restaurants that has them on tap. The Devil's Purse Brewery can be reached at 508-694-7171. 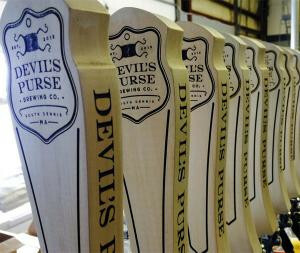 Devil's Purse tap handles. Photo courtesy of Devil's Purse Brewery via Facebook.